I'm so excited to feature Erin from Color Me Styled on the blog today! I'm a loyal reader of Color Me Styled for creative DIY projects, tasty recipes and fun tips & tricks. It's also great to follow along with a blogger who's also tackling a 101 in 1001 list with awesome goals to complete in 1001 days. Follow along with Color Me Styled for colorful, approachable and realistic content that is sure to inspire you. Vogue September 2013... I'm dead serious. That thing was 2 inches thick and I'm a busy lady so I'm paging through it story by story. I also read a lot of blogs and e-mail newsletters on a daily basis. My favorite dessert is creme brulee and I will order it every chance I can. And, I hate to be evasive, but I love way too many restaurants to pick a favorite. We try new recipes at home all the time and I find cooking to be a lot of fun... and there's always a frozen pizza as back-up in case the experiment goes south. Blogging introduces me to new people and it feeds my curiosity to explore. 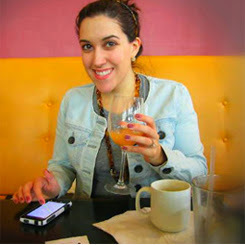 I have made incredible connections with bloggers here in Chicago and love getting to know them personally. We all have online personas and it is fun to get a bit behind the scenes! I've always been curious and adventurous and a prolific story teller. Since I've started blogging (Life Guide by Erin in 2008*, Daily E in 2010, and Color Me Styled in 2012) I find that I approach events, pop culture trends, and shopping with a whole new set of questions that are related to blogging and how I can spin these events into posts or stories. * I recently found this blog again and love to see how far the blogging world has come in just 5 short years! I started it as a marketing class assignment and then I blogged when I moved to California and then hit-or-miss once I moved back to Chicago. While it is awesome to see how things have changed, a lot of my outlooks have stayed the same! I still love DIY projects, the Olympics, and good old fashioned paper.